Induction power melt medium frequency core less induction furnace with a capacity of 500 kg melting rate 500 kg/hr respectively capacity - 200 tons/months. We have 2 moulding machines html 3 with table size 24*24 production of 35 mould box /hr and hand moulding with pneumatic rammers. Done with the help of muller machine 4 nos. Sand type - green sand, dextrin sand, silicate chemically bonded sand. Manually in all types of sand include silicate, resin sand and no bake sand system. 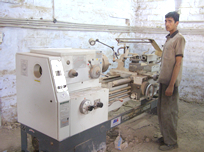 C02 hand moulding facility with maximum 750 kg single piece with pneumatic rammers. 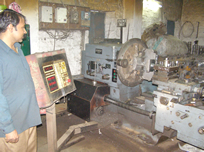 Shot blasting machine with an out put of 200 tons/month heavy duty pedestal grinders, swing wheel griders, disc grinders, pencil grinders for removing burrs from castings. By 2 nos. Over head cranes of capacity 3 tons. Capacity 2 tons manual (electric element). specially designed for manganese treatment for sg. Iron grades. 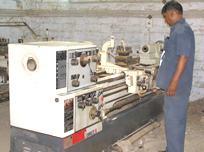 kirloskar lathe total 30 machines, drilling machine, shaper machine and one cnc machine.